Shri Chhagan Lal Shrimali was born on 25th June, 1961 at Barmer district. He obtained Post Graduate Degree in Political Science. He started his career as Rajasthan Administrative Services in 1987 as under training, HCM RIPA, Jaipur. 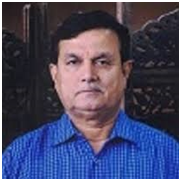 He has more than 26 years of experience in administrative services in various capacities such as SDM Bali, CEO Barmer, Secretary UIT-Pali. He joined as Registrar, Agriculture University, Jodhpur on 06/10/2018.